Back in May, 2018, Roger Stone announced that he was "prepared to be indicted" by Mueller, and sure enough, in a pre-dawn raid on January 25, 2019, he was arrested by the FBI. 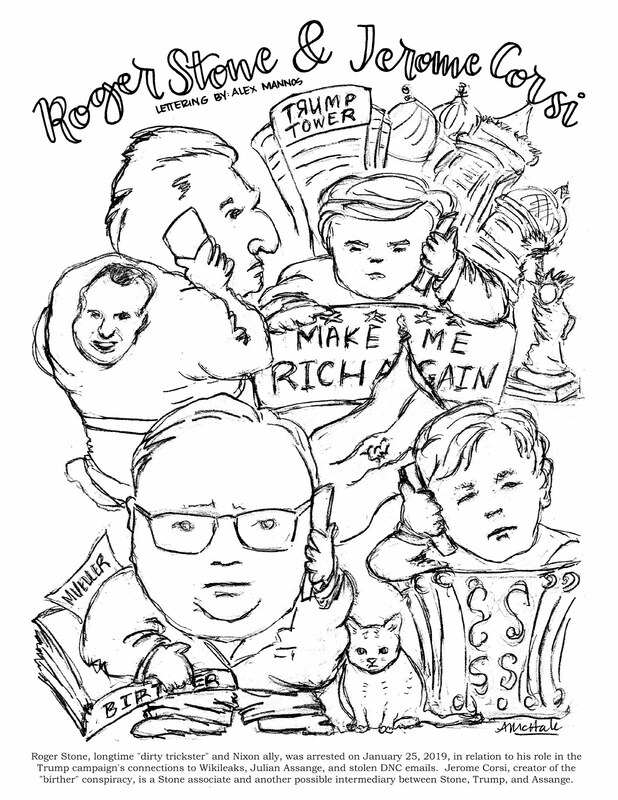 Becauase of the centrality of Stone to the Wikileaks/Russian campaign interference, we have made an exception to our usual practice of featuring cartoons that always include the lawyers for the major players (when they are not lawyers themselves). Stone is of course represented - by Robert Buschel (Nova Southeastern Law '95) and Grant Smith (Univ. of Miami Law '89) of Fort Lauderdale, Florida. Buschel and Smith have been representing Stone since at least March 2017, when Buschel wrote to the Permanent Select Committee on Intelligence, headed at that time by Rep. Devin Nunes, regarding Stone's testimony before that committee - the very testimony at the center of the current indictments (Paragraphs 19-21). It remains to be seen whether Corsi, too, will be indicted, for his possible role as an intermediary between the Trump Campaign and Assange/Wikileaks. He has confirmed that he is "Person 1" in the Stone indictment. Corsi is represented by Larry Klayman (Emory Law '77) and small-town New Jersey lawyer David Gray. Klayman, a founder of "Judicial Watch," is a longtime right-wing activist and Clinton opponent, who has been frequently disciplined and actually banned from two federal courtrooms for life. The precise connection between the official Trump campaign staff (including Steve Bannon and Paul Manafort, Donald Trump, Jr., and Jared Kushner), others with looser affiliations (like Roger Stone) and their associates (Jerome Corsi, Randy Credico), Julian Assange and Wikileaks, and the Russian GRU, is yet to be fully spelled out. It is also unknown what exactly Donald Trump knew (and when), or whether he had any idea that obtaining campaign help from the Russians (through whatever set of intermediaries) was illegal - or whether he would have cared. Roger Special Counsel Mueller's "Stone's Throw, perhaps moving closer to who directed a high Trump campaign official to engage with the trickster. One of these days, Julian Assange will have to leave his embassy. Hope his cat comes out of it all okay.